The Song Dominion was formed in 29 A.E. by an alliance of the Decheerans, the Nusriza, the Amaians, and the Ry'nari to oppose the forces of the Ishvana during the Bushraki War - the first invasion by the Ishvana in 40,000 years, since the War of Extinction that saw the end of the reign of the Elder Races. 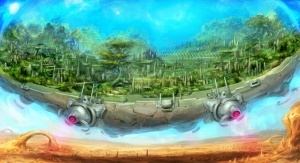 They chose the planet Song - long a shining jewel of multi-species cooperation - as the capital of their budding Dominion. Rich with life and abundant with natural resources, it had been settled and built up more than a thousand years prior. They immediately hired the Free Fleet, led by an aging but still-brilliant Mezer Juul, with Maddox Khan and Akari Lane as his seconds. Alongside that formidable force, they built a combined fleet jointly supplied by the formerly individual militaries of the involved races. Together, they pushed back the Bushraki and Vendal forces of the Ishvana, until a desperate all-out assault destroyed Mezer Juul's command ship, throwing the Song forces into command paralysis until Maddox and Akari took control and saved the day. The capital world was absolutely devastated in an attack by the Bushraki, leaving it a toxic, radioactive wasteland. Its shining towers and verdant fields were reduced to irradiated slag, and the planet's population, which had numbered in the billion, was now less than 10 million strong, and living aboard refugee fleets. Possibly even more tragically, as all now know, Tamiko Lane Khan took this opportunity to use a cast-off Celestine Ascendancy cruiser, broadcasting Ascendancy transponder codes, to blow up a portion of the refugee fleet fleeing the planet, triggering the beginning of the vicious hostilities between the Song Dominion and the Ascendancy that have expressed themselves in the Empire Wars. The races of the Song Dominion examined many planets to relocate their capital to, but ultimately rejected any replacement. Instead, they would rebuild on Song itself. The critics of this seemingly pointless decision were loud and self-righteous in their attacks. It would cost too much. Too many lives would inevitably be lost to accidents leading to environmental exposure. In the end, the complaints were swept aside, and the decision to rebuild on Song was framed as a moral imperative. The Ishvana would not be permitted to drive them off their chosen capital. It would not get the privilege of such power over them without utterly destroying them first. And so began one of the most unique engineering projects and one of the most defiant displays of pure stubbornness Starmourn has ever seen - the construction of Song City. This page was last modified on 30 January 2018, at 17:01.